He mentions that he doesn’t expect to get rich anytime soon on this, but with paid games it’s basically free money. Also, just for signing up you get $100 in ad credit for free, so why not? Additionally, as Luca says, “If a user sees my ad and doesn’t click it, I don’t pay for that – but it doesn’t mean that view didn’t have any value. There’s a theory in advertising that it’s repeated exposure that makes ads work – maybe they’ll see the ad, Not buy the game, so I don’t pay, but then the see it on sale a few weeks and buy it.” For more on that theory, check out Cliffski’s blog. Since there’s not much else going on this week, definitely head over to Apple’s Search Ads Basic page and fiddle around with it. 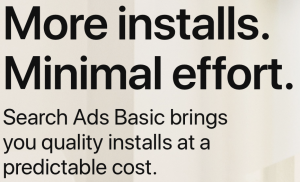 As long as you’re setting your cost per install less than the price of your game, you’re coming out ahead.